to see the progress on that war! We've added the new boxes and all but one has been adopted. Our weather has been up and down...today is 91ish and by the first of the week we should be back down to about 70. 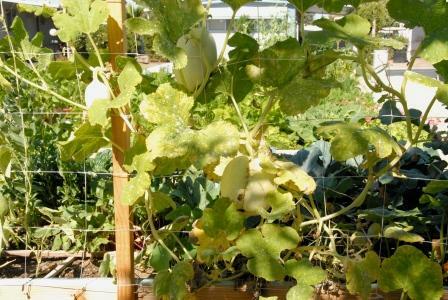 Our humidity has been higher at times which may be causing the mildew on the squash plants. We're all learning so much about gardening...Al and I are learning from long-time gardeners and everyone else is learning about SFG from us! We're hooked and we think they should be too...they think their way is best, but we have a few converts, not everyone, but a few. I'm so anxious to get the greenhouse, not that we need it right now but it's gonna be great to just look at it and dream of what we can begin growing in a few months. 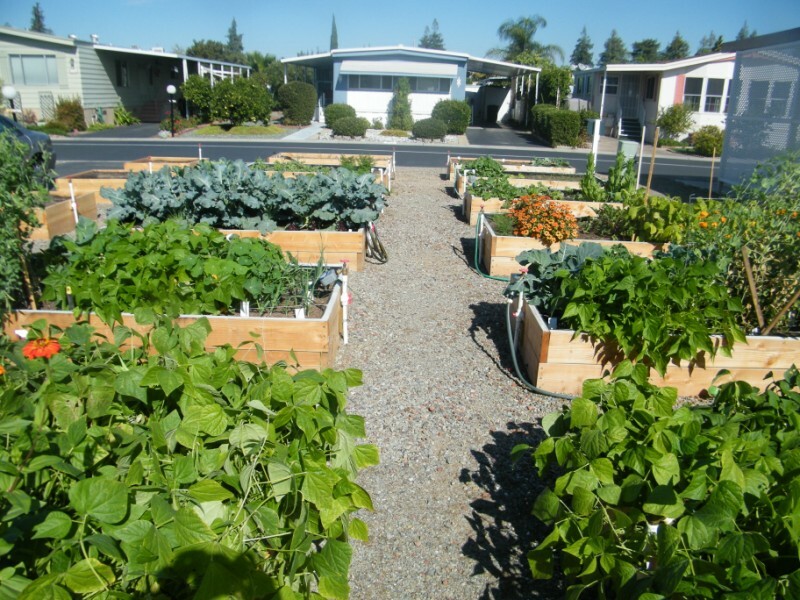 Here in the Central Valley we have such a long growing season...and the variety of veggies to be planted is amazing! In the pictures of our garden site that show the back white fence, take a look at the tree in the far left, and the other two hanging over the fence. The far left tree is an avocado tree with quite a few that look very close to being ripe...AND they are on our side of the fence! The other two trees are loaded with oranges, jillions of them all hanging over the fence...we can hardly wait! This is our Park Manager helping Al. 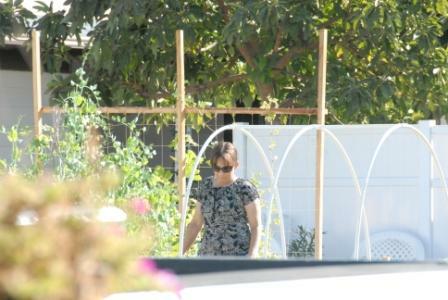 That large plant hanging over the box in the background is Al's zucchini that he planted after the first of Aug! 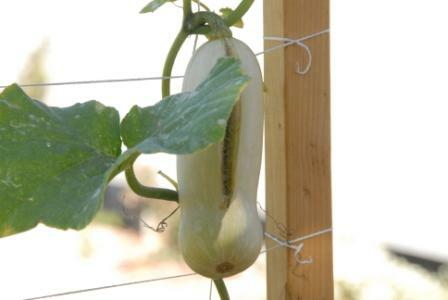 We've already eaten two good sized zucs and there are several more, with blossoms opening daily. Mrs Park Manager is amazed and delighted with the plants growing. She doesn't eat "green stuff" but wants to join in our fun. She's adopting one of the 4x4's! That tree behind her is the avocado tree. These are my yellowing spaghetti squash plants. Not sure what to do but I just tried the milk/water spray today. Hopefully it works and I don't lose these guys! Something caused my Butternut squash to split. Will it continue to grow?? The Big Zapper!! This is on a timer to go on at dusk and off at dawn...and we hear it zapping those nasty moths all night long! Well, we know it is because we find their crispy little remains in the morning! Do you think it would do any good being turned on during the day too? Our garden site today around 2pm facing north easterly. The avocado tree shades my garden box from about 11am - 2:30pm but my broccoli, cabbage, cauliflower, and other plants don't seem to mind...other than this may be adding to the mildew problem on the squash leaves. So impressive! I love it. Laughed at the "don't eat green things"!!!!!! Isn't gardening fun! I love it! and your garden beds look fabulous. I am so jealous of the avocado and oranges! As to you yellowing squash plant, if I may suggest a solution of Miracle grow, or a store brand of the same ( follow the label directions!) Those plants look a little hungry for some nutrients. Looks great! What an awesome addition to your community. I can't wait for oranges to come on; we have a tree in the front yard and that was heavenly last winter! Definately no on the daytime bug zapper ....unless yr just looking for a "thank you for your support" card from your utilities company. BEAUTIFUL! Just beautiful.... you must be so excited, I'm so happy for you! Regarding that split in your butternut squash... no expert here, but I'm guessing the fruit grew faster than the skin could? Perhaps a rainstorm or other sudden change in water supply caused it? Thanks for all the great comments. 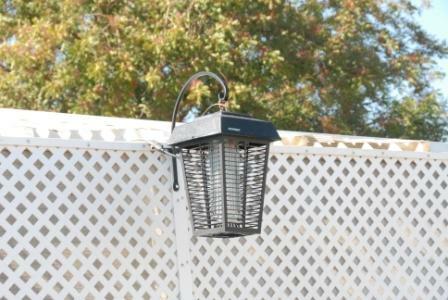 We nixed the idea of leaving the Zapper on during the day, not so much for the electricity usage but because we don't want to risk killing the dragon flies, lacewings, lady bugs, etc that are doing their helpful business in our garden boxes. Al and I were sitting in the garden this morning and both of us are just positive the squash leaves look greener...yeah, I know, it's only been since yesterday but they do! The milk/water treatment seems to have halted the mildew on the leaves and the overall plant looks better. This morning Al gave them a drink of MiracleGro. Until now nothing had been added to my box other than "by the book MM" because this was an experiment to compare with all the other boxes. For whatever the reasons, this box needed some supplements. As for the split squash...Megan, I think you're right about the water supply. Our weather turned HOT a few weeks ago and the entire box needed way more water. We have a worm tube (per Josh's instructions!) and I found a bunch of the little red wigglers struggling on the surface. I'm now watering longer after the moisture meter showed less than it should have, and only half way down in the box. Geesh...what a science this is, keeping all the things juggling at the same time!! wow, very nice--ya'll have done a lot of hard work. Excellent Job. Our gardens survived some heavy winds and a bunch of rain...more than we normally have this time of year. I know, some of you live in areas where what we have would be called a "drop in the bucket" and a "breeze", but for us this was more than normal! One of our newest gardeners is a bit sad because his newly planted broccoli is tilted, due to the wind. The plant has already begun growing straight up, so it has a funny "L" shape at the base of the stalk. I'm sure it will survive. Some of his onions were planted upside down and we replanted them a week ago...a few are actually up now! This is his first garden ever...so seeing his spinach and lettuce seeds sprouting is so exciting...and the rest of us get to share the joy with him. All but 2 of the new boxes are planted...we now have 16 4x8s and 4 4x4s. We have a few more newbies in our garden...they're just so excited about growing something! Mostly it's lettuce being planted...in our area it should grow almost until Christmas, and with a cover and some extra TLC it might make it on through the winter. Our Manager was in the garden yesterday and talked about adding some boxes to areas of our park that are now covered with lawn. 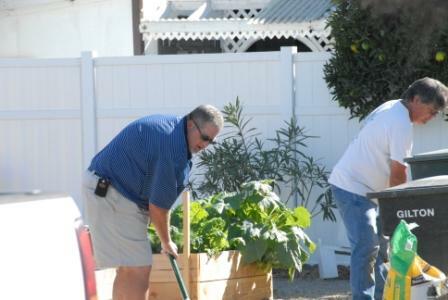 To cut down on the water bills and overall upkeep he was suggesting we might put more of these garden boxes in various small locations...I think this is a WONDERFUL idea...I'm checking out the areas for sun/shade patterns and interest from close neighbors. By next Spring I can just see me tootling around our park in my very old and classic 3 wheel all steel golf cart...my very PURPLE golf cart! Think the color of the deep purple petunia...yep, that's it! I'm now the "Garden Lady"! When the trim is painted and Al gets the rest of the parts attached I'll post a picture. I asked Manager about the green house that was being discussed. I thought it had already been ordered but he said he was still looking. Any suggestions for either a kit, or directions on how to build one? I'm sure I can Google something too, but if anyone has some great ideas they've already used, I'd love to hear from you! We had a lot of rain on the weekend too. Sorry to hear about the winds though. However, sounds like things survived pretty well. As for the broccoli, I sometimes put in a support while they are young to help keep the growing vertical. I use thin bamboo about 1 -2 feet long and move them as needed. They have not bothered the roots in the past so it might work well for you folks too. Thanks Shoda! I think if we put some supports around his broccoli plants our newbie will feel better. Funny how quickly we, as gardeners become so attached to our "babies"! +1 Thank you so much for sharing this FANTASTIC news! I'm so excited for you.... both the newbies getting excited about their first gardens, and the interest shown by the management. Rock on! We had the most enjoyable time in the garden today...Chopper was here! 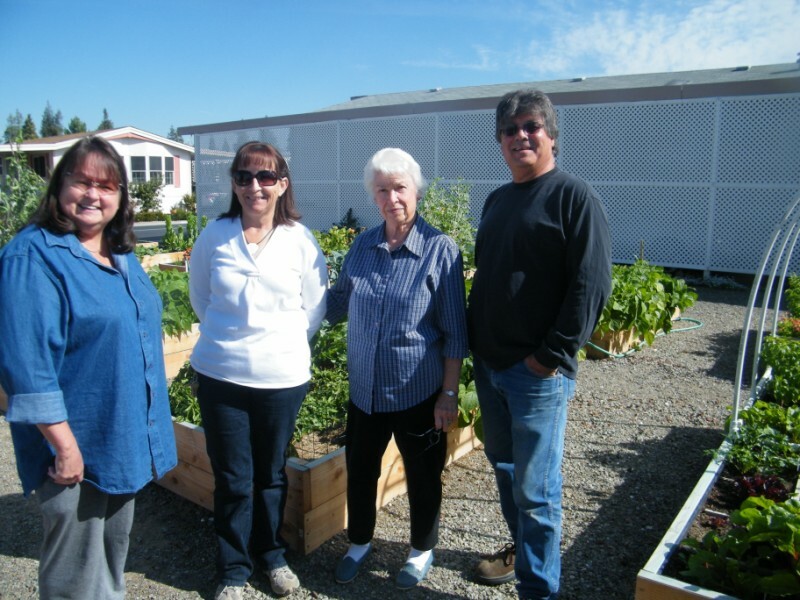 Several of the gardeners came to meet her and talk about their own garden boxes. 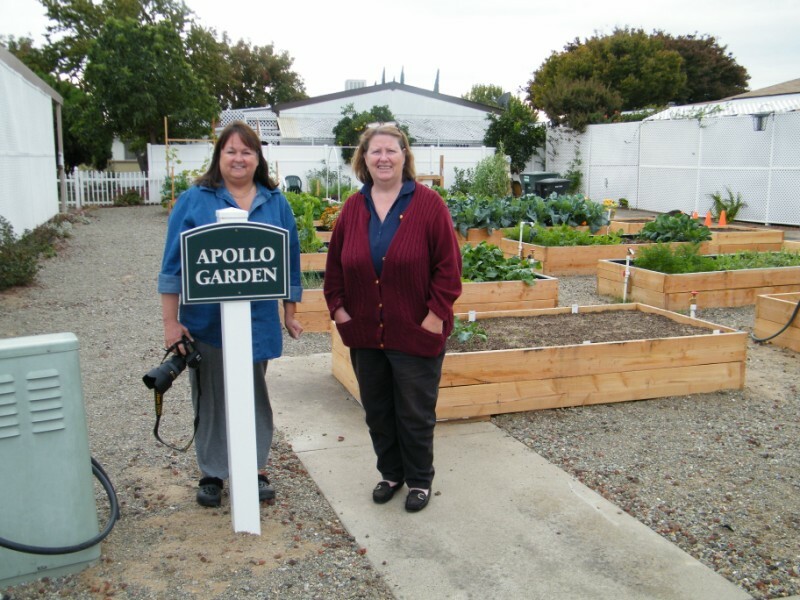 Al and I were just delighted to finally meet Chopper in person, and learn more of her gardening techniques while we shared the few we have. Such fun to walk through our garden site with someone we've only known on this site! Thanks Chopper for taking the time to stop and say hello...and for the goodies you shared from your garden! It was a most instructive visit. One of the gardeners shared that spraying aphids with ice water works wonders. 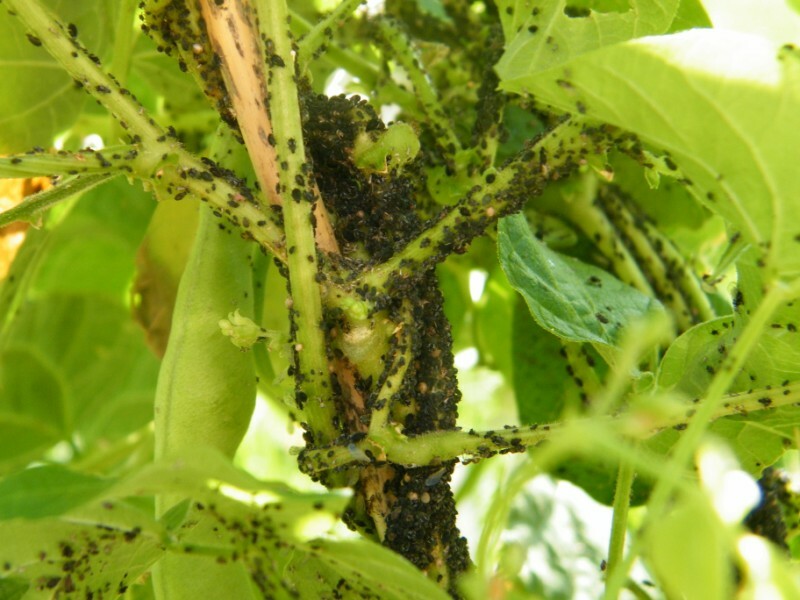 I am definitely going to try that as aphids have become prominent in my garden. Al and Sheila do not do the garden justice. It is really an excellent setup and I am very glad I had the chance to swing by. They generously gave me some salad greens from the garden which is exciting as mine will not be ready for a month or so. And one of the other gardeners gave me some sugar snap peas to try - and they were delicious. Gardens really bring a community together and Sheila has done a great job organizing the troops. We did agree that although we are not averse to feeding our plants that nothing beats the spongy goodness of MM to give the plants a great medium to grow in. Just when we thought we won the war on those darned worms, and just when we were enjoying all our plants with big beautiful leaves and no holes...we have snails!! Now how the heck did they get there you may be asking? Well...now that we've had some rain and the dry rock around all the garden beds is wet and smooth those snails have a great time sliming across to the yummy plants! I'm sure these first guys have already sent out the invitations for humongous family reunions to come devour the buffet we've set out for them!!! Grrrrr...one thing right after another! Time for some snail bait, probably around the outside of the boxes and then all around the perimeter of the entire garden site. Today Al and I have been designing and planning some PVC frames for covers for all the garden boxes. We'll put a few together, see what the pricing is and offer to the others...they can make their own or we'll do it for them. 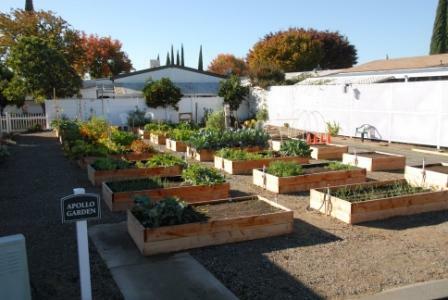 These garden boxes are just too beautiful to let the frost destroy them. 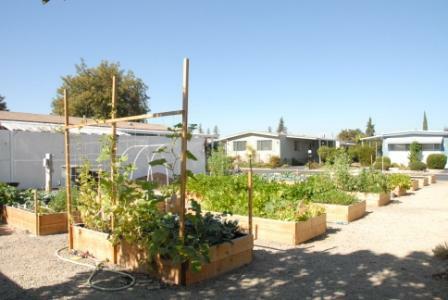 Last night we attended a social gathering here at our clubhouse and I was so amazed at all the comments, congrats, and compliments on the work we've done pulling this whole community garden site together. One of our neighbors sat and talked for some time about the gardens and when I suggested she begin gardening with us she said she couldn't because of her mobility limitations. I quickly told her of our plans for the table top boxes and she began to listen more closely. I'm not sure she'll really take us up on the offer but I'm hoping she'll at least stop by more often and tell others who use the motorized chairs. We really have something for just about everybody! Ok, So, I know there are going to be snickers to my suggestion but I think it's a great solution. More yummy for the tummy! Garden Snails are Escargot! Ummm, wellll...(me, hem hawing around here, stuttering and stammering) ... I'll let you know how that works out! The next time I want Escargot, I will go to a French Restaurant. I checked out the link and the idea of purging snails for a minimum of 4 days and plucking out the dead ones as you go is downright . Sorry I am such a girl about these things. well, you could consider it farming, er, sort of. Kind like raising chickens, no? @camprn wrote: well, you could consider it farming, er, sort of. Kind like raising chickens, no? NO!! But I'm tempted to ask Management if we can have a couple of chickens in the garden site to eat all the worms and other critters...snails maybe?? Somehow I don't think he'll go for chickens! Did I tell you our greenhouse was ordered last week??? It's 6' x 8' from Home Depot and should arrive in another week...I can hardly wait! Very exciting. I hope some of the mobility limited people can get some space soon, it really is a life brightener. Snails! I have done midnight runs to the point where I thought they must all be dead and yet back they come. I use a snail-be-gone product that is a black and in a squirt bottle and it has the consistency of liquid comet for sinks. It is nice because you can control where it grows and it works even after getting wet repeatedly. It is foolish of me at this point to think anything but poison will control them. We held a "garden group" meeting on Sunday with most of our gardeners attending. It was really great to have a few of the very new gardeners joining us so we could share the history of our gardens...the joy of the first sprouts and the horror stories of those darned cutworms and other critters! So far we've all been victorious in our battle and almost every garden box has produced more than enough for harvesting and yummy meals. 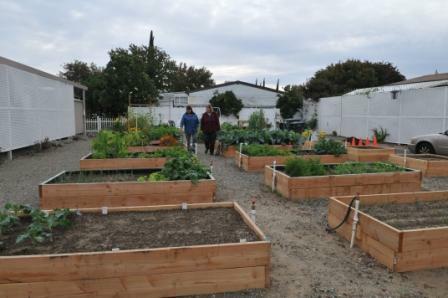 During the meeting as we discussed the future goals one of the guys described his take on this "community" garden idea. I couldn't help but smile as he was suggesting that for summer we might want to have one box designated for peppers, one for tomatoes, one for eggplants, etc...and then we could just all share the crops. No one totally objected and several were nodding in agreement...I'm not sure how many will really want to do this, but this is certainly heading in the right direction of a "community garden"!! I love it! Here is a picture Al took on Monday morning after our heavy rains all day Sunday and through Sunday night. The plants in the boxes are just sparkling with rain drops...not too visible in the picture but everything just looked gorgeous! This was about 9:30am and the sun was not on all the boxes yet. You can see the trees in the background that are just beginning to turn reddish orange. The rock on the ground over the sand below it makes for easy walking and working around the garden boxes even right after a heavy rain...we've got great drainage! For those of you in the cold and snowy areas...sorry. Not trying to brag but this Central Valley weather right now, Nov 10th is awesome! At 9:15am we're at 49 degrees and will have highs of mid 60s all week, maybe 70 by the weekend. Our plants are loving it! So are we. You have sown quite the seed of your own with this project. We had our first frost! It wasn't a lot of frost, but when I looked out our kitchen window toward the garden boxes I could still see the white on the roofs across the street and on the other side of the garden. It was about 7:45am on Thursday. Yahooie...now some of our stuff will really get going. Some of our stuff will need to be protected. Some of our stuff isn't even planted yet! Tomorrow we're going to add the sleeve-type holders to our garden boxes for the hoop frames we're making...sorta covered wagon style, but more our style. We'll post pictures as we go.